Author: Chris Davis at RAL Space. As scientists we are increasingly required to justify our science in terms of its impact on society, but it is important to make sure that we are not guilty of exaggerating our claim. Last month I was invited to speak at an even organised by Mike Hapgood at the Institution of Engineering and Technology entitled “Solar Storms: Predicting and protecting against geomagnetic storms”, which brought together scientists, engineers and representatives from the space, power, aircraft and maritime industries. I reported on how techniques developed from the STEREO mission were now being applied to operational forecasting with the UK Met Office. The meeting provided many clear examples of the extent to which the Sun and solar wind could affect modern technologies, and presentations from industry on how they were addressing these challenges, but there were also some statements that were contrary to the easy sound-bites that we often hear bandied about in the media. I thought it would be useful to repeat a few of these facts here just so that you are aware of how space weather is regarded within industry. Mike Hapgood gave a historical tour of space weather. In 1859, telegraph disruptions were reported in response to the well-known ‘Carrington’ event . In 1936, telephone and railway signals were affected, while during World War II, space weather events caused radar interference . In 1989 and 2003, power grids were damaged by space weather events and in the 2003 storm the Global Positioning System (GPS) was disrupted. Modern technology is becoming increasingly vulnerable to varied aspects of space weather. As a result, space weather now explicitly mentioned in the UK National Risk Register but there is still much work to be done on understanding/forecasting the risks involved. Captain Bryn Jones stated that one airline had estimated around £100 million spent in extra fuel as a result of diverting flights away from the polar regions during space weather events. Modern aircraft fly at higher altitudes where the air is thinner but have an increased risk of radiation exposure as a result. Counter-intuitively however, the magnetic shielding afforded by the passage of a CME can actually reduce the flux of energetic particles into the Earth’s atmosphere and aircraft. 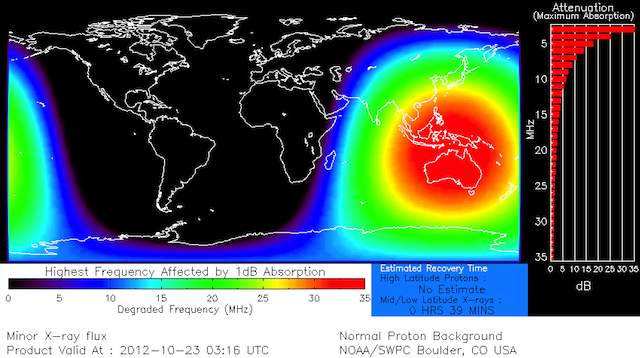 Increased x-ray flux from solar flares along with CME-induced auroral heating low in the ionosphere increases the absorption of radio waves, resulting in temporary radio blackouts for aircraft, especially on trans-polar routes. It is this loss of communications (along with the increased risk of radiation exposure) that requires aircraft to be routed away from the poles during space weather activity. If all else fails though, aircraft will communicate with each other over shorter distances to relay information about flight-plans, weather systems etc. Timely intelligence is needed to help the airline industry plan for solar storms. Industry users are in the process of producing a wish-list of forecasting requirements. Ideally, the airlines would like to plan routes 7-days in advance while space weather warnings currently only offer 1-4 days notice. Keith Ryden from QinetiQ talked about the changing vulnerability of aircraft to space weather events. An aircraft like Concorde was very different from an Airbus A380 which is ‘fly-by-wire’ (in 2008 an A330 aircraft underwent a series of unplanned dives that were thought to be caused by cosmic ray interference with the control systems). Computer models run by QinetiQ suggest that there was a tenfold increase in solar particle radiation at 39,000 feet during the 1989 event and that such levels could reach 1000 times at the same altitude for an event like the Carrington even in 1859, though the effects would be localised. Since a Carrington-like event has not impacted Earth since modern measurements began, dealing with such extremes needs to be part of a risk management plan. Paul Cannon spoke of a report that is currently being prepared by the Royal Academy of Engineering on the potential impact of space weather on the UK. This report, focusing on engineering, will be published early in 2013. One highlight from the report that he shared ahead of publication is that the UK mobile phone network is less vulnerable to the effects of space weather than its US counterpart because the UK system does not rely on the Global Positioning System (GPS) for timing information. Increased absorption and scintillation of the GPS signal is known to occur when the ionosphere is perturbed by space weather events. The report concludes that a mixture of forecasting and engineering solutions will be required to mitigate the impacts of space weather but forecasting is not mature and more work is needed. As if to confirm this, Mark Dickinson reported that despite subscribing to space weather forecasts (such as those distributed by NOAA’s Space Weather Prediction Service) , in 170+ operational years in space Inmarsat operators have not taken any action as a result of a space weather report. They are not accurate enough to be worth the risk. Space weather forecasts are instead used for providing contextual information and post-event analysis. The meeting concluded with a panel discussion during which Richard Horne made a plea for the various industries represented at the meeting to provide input to the research council science strategies such as the STFC Programmatic review. I hope that this joined-up meeting leads to some joined-up collaboration between the research and industrial communities. Severe Space Weather Events – Understanding Societal and Economic Impacts: A workshop report (2008), National Academies Press.